[Last updated February 14, 2012] As Meaford develops strategies for growth and economic development, it has consistently recognized the importance of the Municipality's rare and valuable heritage buldings and landscape. But despite the worthy intent of many of these documents, the Municipality has yet to put any real protection in place for heritage buildings or natural features. If an owner wishes to demolish a building, the Municipality's staff often has no option other than to issue a permit. They're not armed with the bylaws and policies that might allow them to deny such a request. Here's an overview of various recent initiatives, with some commentary, excerpts and links to actual documents. 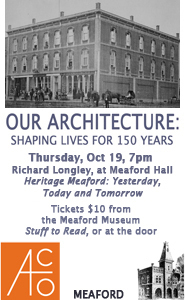 Meaford's Official Plan sets out Cultural Heritage goals and objectives on page 14. It is the goal of this Plan that the Municipality�s cultural heritage resources be identified, conserved and enhanced whenever practical. 1. To enhance the character of the Municipality by protecting and maintaining the Municipality�s cultural heritage resources. 2. To encourage the retention of cultural heritage resources wherever practical to provide continuity between the past and the present. 3. To foster civic pride by recognizing the contribution that cultural heritage resources make to the rural and urban fabric of the Municipality. 4. To use cultural heritage resources as a tool to attract additional economic development, increase tourism opportunities and enhance the character and vitality of neighbourhoods and districts. 5. To ensure that the nature and location of cultural heritage and archaeological resources are known and considered before land use decisions are made. 6. To prevent the demolition, destruction, inappropriate alteration or use of cultural heritage resources. 7. To encourage development that is adjacent to significant cultural heritage resources to be of an appropriate scale and character. 8. To continue to develop a comprehensive inventory of the Municipality�s built heritage and cultural heritage landscape resources. 9. To consult and seek the advice of established heritage organizations when making decisions regarding the conservation of cultural heritage resources in the Municipality. The section on Heritage and Archaeological Resources declares that it's the intent of the Official Plan to "recognize that the maintenance of the Municipality's heritage resources will contribute to the preservation of the Municipality's character," and the intent is to "consult and seek advice from a LACAC or other established heritage organizations when making decisions regarding the conservation of cultural heritage resources in the Municipality." LACAC's, or Local Architectural Conservation Advisory Committees, are now known as Municipal Heritage Committees (MHCs). An MHC is a group established by the municipality, under the Ontario Heritage Act to advise council on identifying, protecting and promoting cultural heritage resources. A Municipal Heritage Committee is an advisory committee of council, created by council to consult and assist council on matters relating to designating and conserving heritage properties. It's made up of people with a wide range of skills and knowledge relating to heritage conservation, historical research, trades-work, architectural history, land-use planning policies, municipal procedures, marketing strategies, legal issues and more. Members don't need to be experts. But they do need to be interested and committed. The MHC takes a load off municipal council and staff, reducing workload and proactively dealing with heritage properties. Council doesn't have to re-invent the wheel; these committees exist across Ontario, and they've been tested in the real world. An MHC means expertise is at the ready to staff and council as the need arises, so matters can be dealt with relatively quickly. A Heritage Conservation District (HCD) is an area that brings a special character and value to a community. Designating a streetscape, neighbourhood or downtown core makes it easier for the municipality to manage change in the area, guide future development and conserve and protect the special character of the area. Often HCDs are united by their shared historical past and character, and a good third of Ontario's more than 100 HCDs are main streets of towns like ours. Among other benefits, HCDs help maintain a small-town atmosphere, preserve a sense of human scale, and ensure that the area remains an economically viable part of the community. The Official Plan outlines the steps that Council may take to establish a Heritage Conservation District in Meaford, and allows for various options for controlling preservation, development, restoration and demolition. This section also says that "It is the intent of this Plan to encourage the restoration or rehabilitation of identified cultural heritage resources by assisting with funding applications, establishing grant programs and creating special taxation districts." In the Built Heritage and Cultural Landscape Resources section, the plan says "an inventory of heritage buildings and structures within the Municipality shall be maintained." Meaford has embarked on a cultural map aiming to promote and support the cultural assets of our community. In Meaford sections of our downtown commercial and residential core seem meant for a Heritage Conservation District. In the last 10 years we've already lost a number of our older buildings and landscapes to the wrecker's ball and the saw. In most cases, there has been no public say in these demolitions; we wake up one morning to hear the trucks move in. No one will argue that business growth in Meaford is necessary and should be encouraged. But the value in our heritage resource is an important part of our economic future. As development pressures mount, we need to have the tools in place so that we don't make hasty decisions (and mistakes we'll have to live with forever.) We need to be able to step back, look at things in a larger context, and be confident that before we remove forever a piece of our heritage and our economic lifeblood, we must follow a process that respects our businesses and the community at large. Combined with the advice, consultation and assistance of an active Municipal Heritage Committee, a Heritage Conservation District would establish this process and give Meaford council and staff the tools to manage our growth and heritage responsibly and leave a legacy for our future. Meaford planning staff submitted a budget item for a Heritage Conservation District study in 2011, but this item didn't make it to the budget. Meaford has also developed a Community Improvement Plan, which was approved and passed in by-law by council (2008). It covers a specific area of the Municipality (though a key one), including Meaford's downtown and harbour area. Among its goals are "to encourage rehabilitation and preservation of significant heritage resources, and encourage the promotion of Meaford's strong historical image." committee to Council on heritage matters. Previously known as the Local Architectural Conservation Advisory Committee (LACAC), Meaford has a bylaw to establish a MHC but has not acted on this initiative. Under the OHA, the MHC must be involved in the review process when applications for site alteration and development are being considered by Council for a Section 29, Part IV designated property and properties within a Part V, HCD. The MHC is often assigned a role in the review of any proposed work for a heritage property. It is recommended that Council consider the formation of a Municipal Heritage Committee and appoint members with knowledge of heritage conservation, architectural design, planning, and other related expertise. This committee would be useful in the implementation and management of the CIP and/or fa�ade improvement program. The CIP also includes extensive "design guidelines" to be consulted when renovating, changing or bulding within the CIP area. And it states that "the specific goals for improvement [include the goal to] renovate and/or expand existing buildings, where approprate, and redevelop with construction that contains compatible uses and is designed to integrate into the local urban fabric." The guidelines are written as a tool to assist property owners with an approach to repair, refurbishment and renovation of their properties so that the appearance of building improvements are in keeping with the heritage character of Meaford. The guidelines are intended to be flexible, to encourage owners to maintain and improve their properties within a broad definition of �restoration� and �heritage�. Many of the guidelines are directed to the repair and minor alterations of existing structures to assure preservation of existing heritage details which contribute to Meaford�s heritage character. proportion, design detail and materials of adjacent buildings, as well as the overall character of the area. The plan suggests a number of financial incentive programs, many of which "Meaford may adopt". establishing a Community Improvement Plan Advisory Committee and "Champion"/Commercial Development Officer (paid official or volunteer), to review financial applications, inspect all CIP projects, and "assist in ensuring that the goals and objectives of the CIP are implemented in the day-to-day administrative decisions of the municipality". initiating many financial incentive programs. On December 12, 2011 Council endorsed the updated CIP action plan with revised timelines included in this report. On February 5, 2010, Meaford released its Economic Development Strategy, which sets out four pillars of economic activity in Meaford: agri-business, tourism, retail and green business. "Some care may be required to avoid ruining the things that make Meaford an attractive place," notes the plan, pointing out that there has been "slow progress on Community Improvement Plan, architectural guidelines, Tourism Area designation." The plan notes that "Heritage assets were seen as providing an attractive ambience for the Municipality, but were not currently a direct attraction." In discussion with the owners [of buildings on Sykes Street rumoured to be threatened] they have also said that they would look to engage members of the community in the consultation process before anything happens on Sykes Street. That same month, concerned by previous peremptory demolition of heritage buildings in downtown Meaford, Heritage Meaford made a delegation to council, requesting that the town place a moratorium on demolition in the downtown area until the new Council had the opportunity to decide on a course of action with regard to developing bylaws, policies and procedures for heritage preservation within the CIP zone. Meaford Director of Planning and Building Rob Armstrong advised that the options available to council were a heritage conservation district and/or an interim control bylaw. "The main way to deal with this issue is by designating an area as a heritage conservation district which then establishes an area for protection," Armstrong was quoted as saying in The Meaford Independent. "Armstrong advised that it would be possible for council to pass an interim control by-law that would freeze the issuance of demolition permits while a study was conducted." After these items failed to gain traction with council for more than a year, on January 9, 2012 � in the wake of the sudden demolition of the old Grants building � Councillor Barb Clumpus successfully moved that Meaford put $25,000 in the 2012 budget to undertake a Heritage Conservation District study.